In 1936 the newly completed Chevrolet Commercial Body Div. 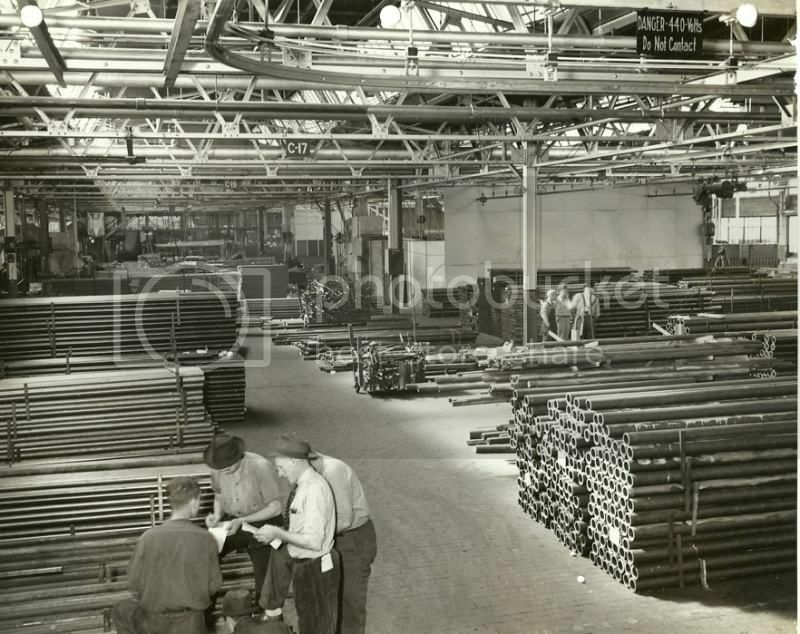 (stamping plant) was a completed 475,000 square feet of floor space all on floor and of modern type. 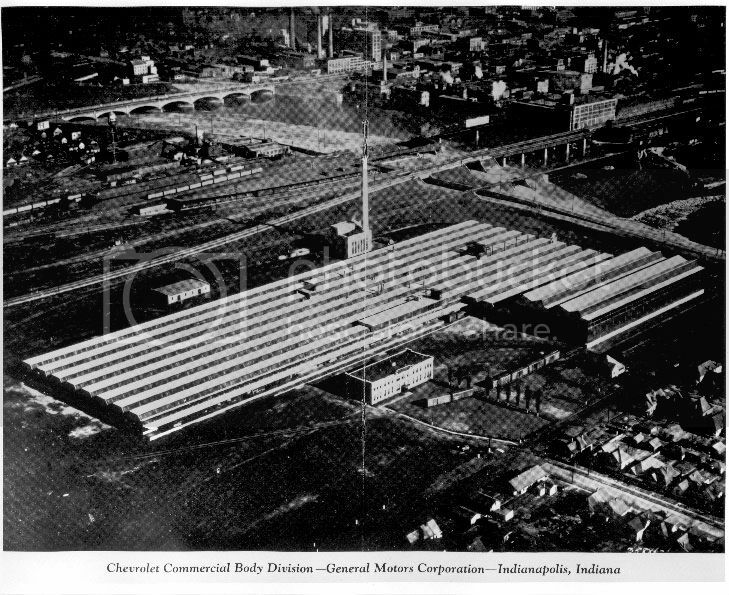 During the period 1930 to 1941, Chevrolet became the largest producer of trucks in the industry and the Indianapolis plant the largest truck body plant in the world. During 1941, The Army and Navy awarded to Chevrolet a number of large contracts for the construction of Military Vehicles. These trucks bodies in addition to some Lend Lease equipment, were built in the Indianapolis plant along with a large civilian production. At the time of Pearl Harbor, Military orders represented about 25% of the volume of Truck Bodies and Cabs being built. With the curtailment of civilian production, the increase in Military orders was not sufficient to absorb more than 25% of the personnel or floor space of the plant. Hence, Civilian Truck production stopped in March of 1942. The plant was converted from stamping to machinery to make Tank Parts, a Turret Plat Gun Mounts for the 37 MM gune. This was from Jan. 1942 to April of 1944. 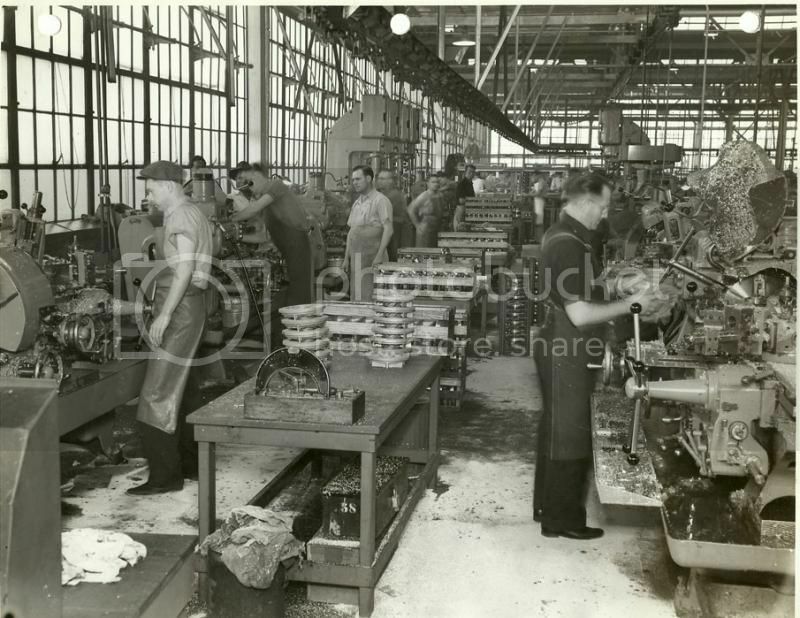 The workforce was retrained to go from stamping, welding, and painting to operating turret lathes, Grinders, Automatic Screw Machines. and Engine Lathes. Some images from during the war. Running a small punch press. Furthermore: At the outbreak of WWII the Chevrolet Commercial Body Div. 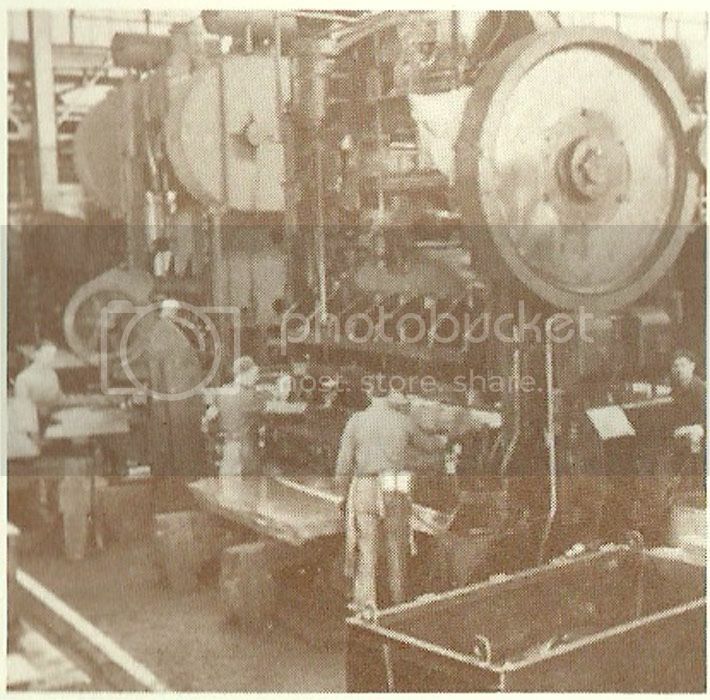 stamping plant was the only plant owned by General Motors Corp., devoted to the manufacture of Truck Bodies for Chevrolet and G.M. Trucks. Naturally, with a product so highly specialized and the only plant making truck bodies in the corporation, this plant in the original conversion (to war) plans was scheduled to remain a source of Civilian and Army Truck. The Bombing of Pearl Harbor 12-7-1941 made very little, if any, change in the plans for the plant. Trucks were still in major demand in essential War and Civilian Industry, and bodies for these trucks had to be built. The fall of Singapore, the Malay Peninsula, the Dutch East Indies, Burma and the Philippines to the Japanese, cutting off completely our rubber supply made necessary drastic changes in Governmental plans regarding the construction of additional civilian trucks, which, on order of WPB ceased entirely, and curtailed contemplated army truck construction. The change in requirements for truck bodies naturally released both plant capacity and man power for other more essential task. 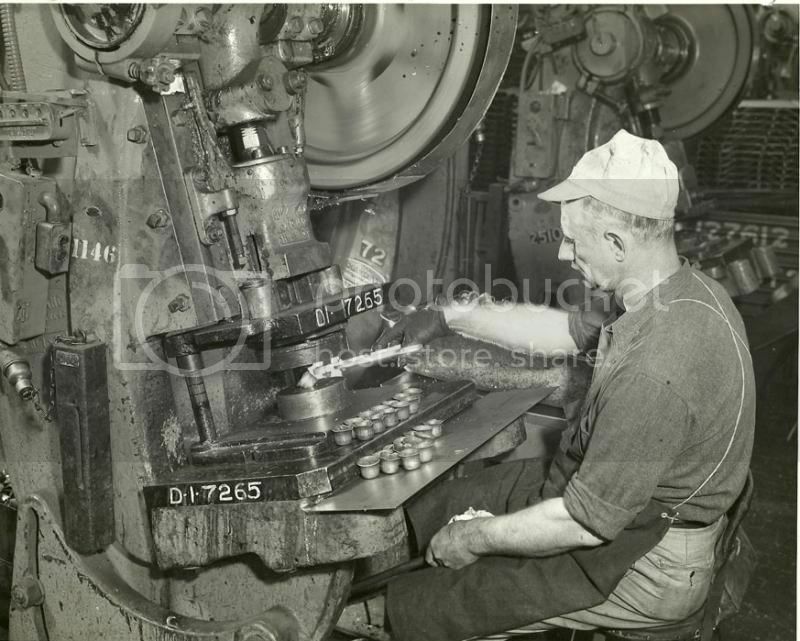 Management Challenges: First, Indianapolis Stamping was a plant high specialized from a machinery stand-point, composed of heavy stamping and drawing presses. Electrical Welding Equipment, Body Assembly Lines and Paint and Paint Drying Equipment all necessary to construction of truck bodies in volume. Personnel composed of highly trained Pressman, Assemblers, Electrical Welding Operators, Metal Finishers and Paint Men. A complete Tool and Die Shop equipped to made huge body dies, with no heavy dies required, as all designs and had been frozen for the duration of the war. Second: The problem of what to make and to make it would have been simple had they been able to clean out all of the truck body building machinery and start fresh with some other war product, but this couldn't be done. 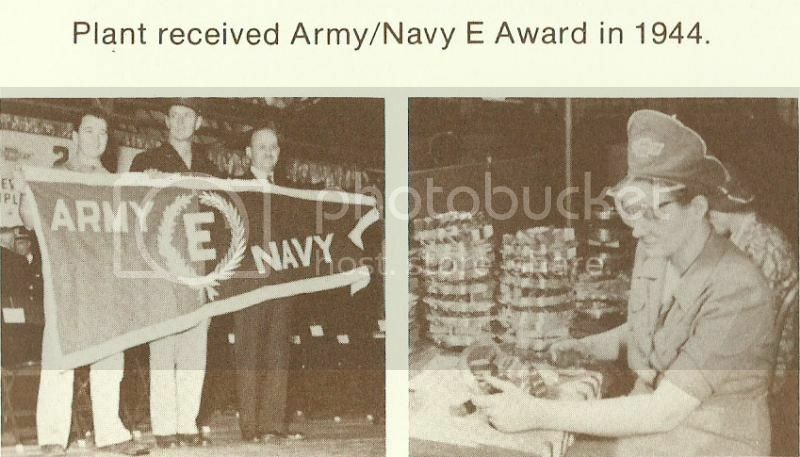 Because, being the only major source of bodies for General Motors and Chevrolet Trucks required by the Army and Navy for certain definite types of work, they had to keep a portion of the plant intact to take care of these requirements. This meant keeping intact sufficient machines, assembly lines, pait booths and drying ovens to handle the considerably restricted requirements of the Army and Navy, and most important, having available their highly trained personnel to operate these machines needed. 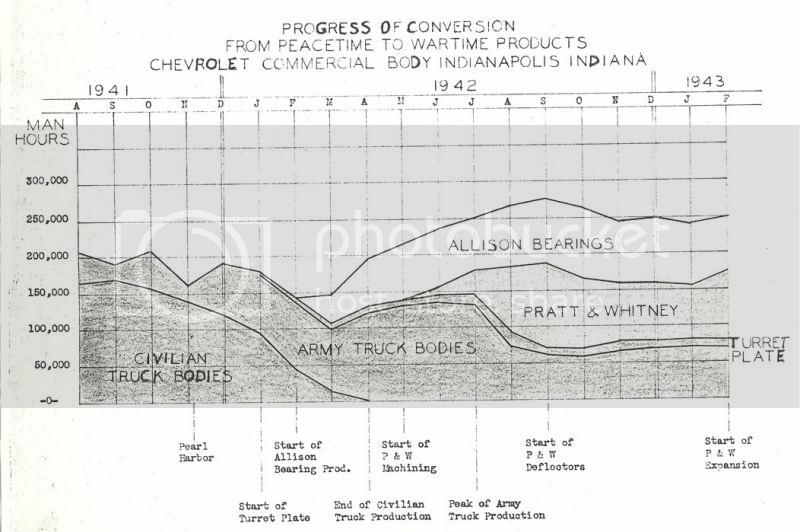 How well the war effort job was done can be best understood by the record of conversion established at the Chevrolet Commercial Body Stamping plant in Indianapolis. The best criterion of how successfully the task was met, is the fact that they delivered the goods as promised, and on time, of many diversified parts they had contracted to made, and yet still were able to take stride such truck, cab, and body requirements as the Army and Navy needed. 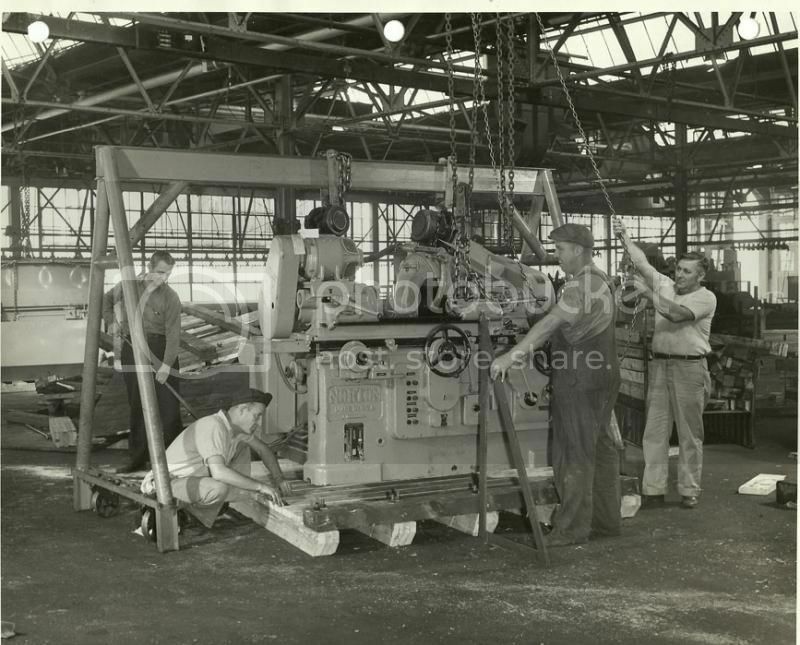 Skilled Millwrights rigging up and moving machines out of the Stamping Plant after WWII. A 40.000 ton Toledo press! Just spotted this,,,, just like mine only in much better shape,,, had a perkins diesel swapped in for the original 97 hp 270 jimmy,, A Rare deuce.5 COE left----> over there by the forces, just notified a couple car crazies who have bought from me in the past in France, hopefully it will have a new life as a car transporter. early 36 maybe a chevy--maybe a gmc 4x4 , interesting site for sure! Love those old "hand drawn" charts. Good info, too, for posterity. Thanks... it really does shed a lot of light on what was going on at the Stamping Plant during WWII. I have a company typed overview about all the details pertaining to the plant transformation before, what was happening during the war and the reconstruction after the war. Amazing all the hard work that went into these undertakings. And of course Engineering was the foundation for all of this. And of course Engineering was the foundation for all of this. In all seriousness, the amount of work required to change a plant over (like at an annual model change) seems virtually impossible. But we used to do it every summer, somehow.